The same type of statements are very common in Hindu literature and in Yoga texts. Non-Violence and a vegetarian diet have long been part of India’s spiritual traditions Vedic, Buddhist and Jain, so much so that they are often the main things that people think about as characterizing these teachings. However, Hindu Dharma – as the world’s oldest, most diverse and most tolerant religion – has teachings and practices for a variety of temperaments and levels of both individuals and cultures. One cannot reduce it to a few simplistic rules or stereotypes. It is much broader both in theory and practice than Western monotheistic religions. Like the proverbial elephant and the blind man, one must learn to look to all sides of it. This topic requires the same many-sided approach. Most Hindu sects have emphasized vegetarianism as an important aid for yogic and spiritual practices. Hindu monastic orders require vegetarianism for their monks. Hindu temples and ashrams routinely serve only vegetarian food and have done so as far back as anyone can remember. Hindu Dharma has emphasized the care of the cow as a symbol of the beneficence of the Earth and the Divine Mother. Many Hindus have practiced cow protection and asked for cows not to be slaughtered for food. Mahatma Gandhi himself was a great proponent of cow protection. That being so, it must also be noted that no one has never had to become a vegetarian to be a Hindu. Historically a number of Hindu people and communities have eaten at least some meat and fish. This is particularly true of the Hindu warrior class or the nobility, who were allowed to use weapons to protect their communities from harm. Many Hindus in India and the West today eat chicken and fish, some even lamb. Certain Hindu groups in the east of India, in Indonesia (Bali) and in Nepal have continued to eat meat and practice animal sacrifice in their temples and have done so for many centuries. Some Hindu Tantrics have included the ritual eating of meat as part of their spiritual practices. Yet that also being so, it must be noted that many, if not most of the Hindus who have eaten meat still regard vegetarianism as better or more spiritual, and would prefer to maintain a more vegetarian diet if they could. Their eating of meat does not serve to negate the importance of vegetarianism in Hindu dharma. Lacking a broad understanding of the subject, and probably intentionally aiming at hurting Hindu sentiments for political gain, some scholars, particularly Indian Marxists, have emphasized the meat-eating side of Hindu practices. They like to quote a few instances of possible eating of beef in ancient Vedic texts, which they highlight or exaggerate, as if this invalidated the numerous Hindus who have been vegetarian or makes a mockery of Hindu teachings about the subject. We should point out that no Buddhist country in the world today is predominantly vegetarian. Tibetan and Japanese monks eat meat, including red meat (even the Dalai Lama). To my knowledge, only the Chinese Buddhist monks today are still vegetarian. Yet this does not mean that non-violence, respect for animals or even promotion of vegetarianism are not Buddhist or are opposed to Buddha Dharma. In ancient times, there was an even greater diversity of culture, education, agricultural practices and life-styles among the different peoples of the subcontinent of India that Hindu teachings reached, including several nomadic groups. These different groups were given their freedom in determining their diet and culture, which in some instances included meat eating. Yet when meat eating was resorted to it was encouraged to be done only as a sacrifice, a sacred ritual, often only performed on special occasions, not in the modern consumerist manner, much less the American style of beef for dinner every night. If we look at the whole of the Rig Veda, which is the oldest and the longest Vedic text (routinely said to be anywhere from 3500 to 5000 years old), the main Vedic offerings are ghee (ghrita), honey (madhu), Soma, milk (go, payas), yogurt (dadhi), grain (yava) and other plant and dairy products, which are mentioned hundreds of times. Soma, a plant juice, is said to be the supreme offering to the Gods. References to actual animal sacrifices do exist in the Rig Veda but are relatively few, only a handful, and even these are often highly symbolic. Animal sacrifice (pashu bandhu) is outlined in several Vedic texts as one of many different possible offerings, not as the main offering. Even so, the animal could only be killed along with special mantras and rituals. The killing of the bull is not mentioned as a type of pashu bandhu. The goat is the main animal used. A special horse sacrifice also existed (ashvamedha) but was a royal ritual taking an entire year to consecrate a single animal for the sacrifice, not a common article of food! Yet there are a few possible instances referring to the sacrifice of bulls (not of female cows). These might have been symbolic but could have occurred in some communities, particularly of a cow herding type that had too many bulls, or perhaps in times of famine when other food was not available. Such possible rare instances cannot be entirely disproved, but certainly were not common either. The Rig Veda also abounds with the honoring of the sacred nature of the cow, which similarly occurs in hundreds of instances, and continues throughout the entire Hindu tradition. Indeed the Vedic word for cow (gau), also means the earth, the Goddess, a ray of light, the senses, the soul, knowledge, the word and many other mystic meanings, reflecting its depth of connections to the Vedic mind. The care of the cow is a much more important Vedic theme, than any animal sacrifices. One method of distortion that certain politically minded scholars use is what I would call, ‘using an exception to create the rule’. Pointing out a few possible instances of eating beef in Vedic texts cannot be made into a rule for discrediting the great history of cow protection in India. A few Christian monastic groups were vegetarian as well. This cannot be used to make Christianity as we know it into a vegetarian tradition. As Hinduism is such an ancient and many-sided religion practiced by a diversity of peoples and cultures, scholars can find such exceptions on almost any matter to make such points. Hindus also have numerous sacred texts, none of which they have to follow literally. Another method of anti-Hindu scholars is to find something objectionable in some obscure Hindu text, perhaps thousands of years old, which not at all binding, relevant or even known to Hindus today. One can similarly find something objectionable in the ancient literature of any country. Hindus, unlike followers of other religions, are not compelled to literally believe or mindlessly follow what any Hindu text might say, particularly Hindu works on social practices (dharma sutras), which were always subject to modification relative to the needs of time, place, person and culture. This is quite unlike the Islamic Sharia lawcode, which is regarded as binding for all Muslims today. One can just as well point out objectionable practices in Christian lawcodes of the Middle Ages as indicating what Christianity is today! To deal with such distortions, Hindus should know their religion better. They should be aware of the diversity of Hindu groups and practices historically and geographically. What Hindu Dharma overall promotes is a recognition of the sacred. This includes honoring the diversity of life in terms of individuals, cultures, plants, animals and the entire world of nature. Hindu vegetarianism arose out of that recognition and should be viewed in that context. This article was originally published in Hindu Voice UK in September 2006. David Frawley’s many books are perhaps the best literature explaining Hindu dharma and its various branches of wisdom in the English language. Many of his articles can be found of the website of the American Institute of Vedic Studies, of which David Frawley is director. « Looking back at YOUR life 500 years from now; how do you deserve to be judged? Why confuze Buddha with Hinduism? If you want clarifiations on Hindu philosophy search in Upanishads if not Vedas. Even Puranas might help. Why confuse with Buddha and Buddhism? The last paragraph sums it up. Hinduism is so diversified, democratic and free of any rigidity – one reason why there are somany dieties – in nutshel, it is only a guide for you to be of help to others, harmless, sharing what you have, – always thinking of Him’Her and consder oneself to be only a tool for his/her actions! An interesting article by David Frawley, on Hinduism and vegeterianism, worth a read. Misconceptions have crept as Vedic Scriptures have been wrongly translated/interpreted by some western and Indian authors to down play ancient Indian heritage, culture and vedic philosophy being ignorant about the true meaning of Ved Mantras as illustrated by Swami Dayanand Sarswati in his books of explaining true meanings of Vedic literature. 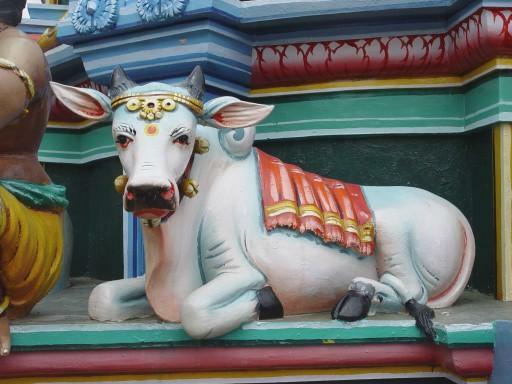 Cow is a sacred animal in Hinduism. Texts of Vedas start with the preaching’s of Ahimsa and Satya (Non violence and truthfulness). Cow is sacred for its value of curing most of the diseases by its milk, butter, urine and cow dung not only for human beings but also for plant life and environment. Killing of allantras animals/birds etc. is prohibited in the VEDAS and Vedic Literature. Dr. Zakir Naik and othes should read Satyarth Prakash and Rig Vedadi Bhashya Bhumika By Swami Dayanad Sarswati and all their illusions about beef eating/cow slaughter in Hindu Religion will vanish. We should propagate universal brotherhood and peace in the universe and we should not peach hatred and ill will against humanity. I pray to the God that good sense may prevail among the preachers of all religions to propagate good values for all human beings and all the creation of the GOD. True brother. Pt. Vamadeva Shastri, like other westerners, simply believes in the griffith, wilson, and muller trash! Arya Samaj translation is the best. You are absolutely right brother. Vedas are 100% vegetarian and against any harmy to innocent animals. Maharishi Dayananda and the other Pandits of the Arya Samaj have done a splendid job by giving the correct translations of Vedas.